There is so many concepts and pieces that I’ve already done for this challenge that I can’t wait to redo and explore some more when I have more time and not just one day to make something. This one on particular, I would really like to redo on a much larger scale with some good quality illustration board. It will take some time though, so after the challenge. I’m a massive Pokemon fan so I do plan on doing some more Pokemon themed pieces for this challenge. 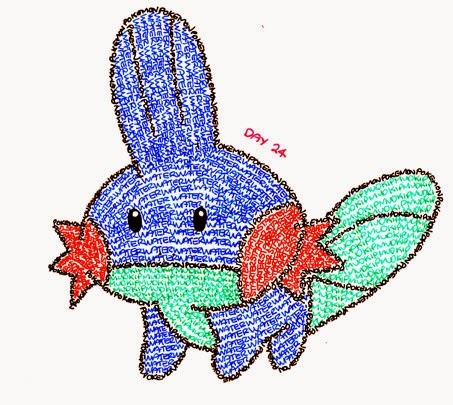 This was done purely using coloured fine tip pens using the words ‘pokemon’,’mudkip’,’starter’ and ‘water’, except for the eyes.